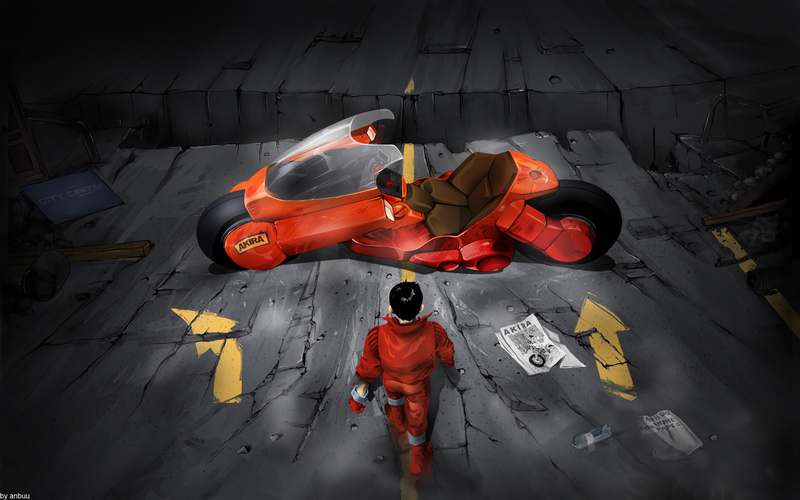 It Was a Film Concept, in which would be a Blending of Both Actual Actors, and Computer Animation… Something that I hadn’t Truly Seen Before. And Listening To an Album by Christopher Lawrence, Called “City of Angels” (Same Name as the Film, but this is something Different), or “Temptation“, which Sadly I can’t Find on Line to give you a Sampler… Correction, I can’t Find A Link to a Song Called “Medusa”, which was The Main Song I played over and over again While Conceiving This Project. But as many of you know, I sat down “Film Making in 2003”, and Screenplay Writing in 2006, so I kind of ended up leaving that Story on the Back Burner. Ironically, My Story was about a Father and Son, which TRON: Legacy was basically about, but mine is a total Different Concept. 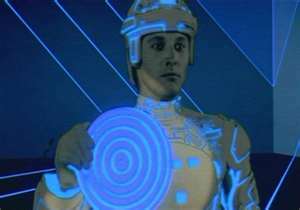 As someone who actually saw the Original TRON in 1982, I can simply say this. Wow. And, Thank You. Talk about being Brought Back to where the first one left off. 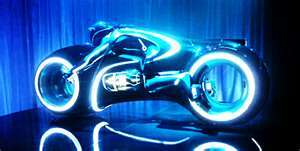 But for the sake of the people who never saw the Original TRON, let me give you a quick overview. Kevin Flynn (Jeff Bridges), Creator of Several Computer Games for a company called Encom, had his Ideas Stolen by a Man named Ed Dillinger (David Warner). 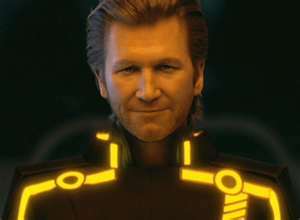 At the Beginning of the Original TRON Flynn has created a Program called CLU (Also Played by Jeff Bridges), and he is trying to infiltrate Encom Computer System to find Proof that he was actually the Creator of these games. Also working for Encom (As a Side Note) is a Scientist that has Created a Device that can Change Matter into a Digital Form of itself. Though Dillinger is the one that Stole Credit for Flynn’s Game Designs, what’s truly in Charge of Encom is their Computer System itself. An Artificially Intelligent Master Control System, which is looking to Build up it’s Data Base in ways such as Penetrating the Pentagon’s Computers Etc., if I remember correctly. Basically Artificial Intelligence Gone Wrong. Even Dillinger is being Black Mailed into Submission by the Master Control. 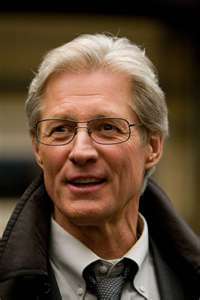 Our Final Element of the Story is a Programmer who works for Encom by the name of Alan Bradley (Bruce Boxleitner). 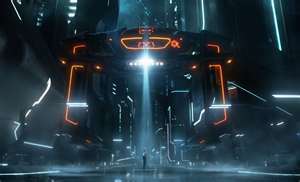 Alan has Created a Systems Security System called TRON, which is basically a Watch Dog Security System that is designed to keep an eye on the Master Control System. 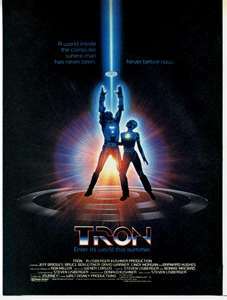 The Master Control determines that Flynn has infiltrated his System, and so cuts all Higher Access to Encom’s Computer System, including Flynn who has a Special Access, and Alan who has access so that he can finish his TRON Security Program, and Activate it. When Flynn finds out that his access is now denied, from Alan who out of frustration has contacted him, he flips. Fortunately for both men Alan is Dating Flynn’s Ex girlfriend, who has Access to Encom via her Position as Assistant to the Scientist who has Created the Matter to Digital Device. The three of them then enter Encom so Flynn can have direct access to The Master Control. In response The Master Control then, as a way to protect itself, turns the Matter to Digital Device on, directs it at Flynn, and wola, Flynn’s transported to the Digital World of Programs. 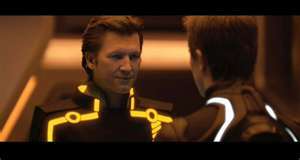 In this world Programs take on the Physical Form of their Users (Program Writers), so when Flynn comes across TRON (Also Played by Bruce Boxleitner), Alan’s Security Program, it looks just like Alan. 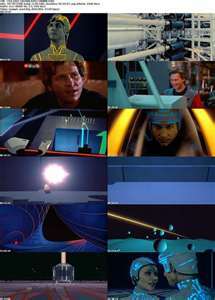 In the end, Flynn and TRON are able to defeat the Master Control, and transport Flynn back to Human Form, where he then takes control of Encom. That is where the TRON First Film left off. Let’s Move On. The Story; Our Story begins 7 years later, in 1989. Flynn is telling his young Son Sam about The Grid, basically the Digital World that he had entered. He tells him he’ll talk to him more next time, and is never seen again. He’s disappeared. Our Story then moves 21 years later, 2010, where Sam is the major share holder of Encom, but other than that has nothing to do with the running of the company. Much to Alan’s dismay, as he is a member of the Board. Sam does however annually mess with the company, as a rebellious act towards Encom, potentially out of anger because of the loss of his Father. Alan receives a Page (Yes he actually has a Pager, lol) from Flynn from his old Place of Residence, an upstairs room in an Arcade that he also owned. Alan tells Sam, and he checks it out. Sam is then hit with the Matter to Digital Beam, and is now in the Program World. In this World, like the first film, Programs are either Reprogrammed for the Rulers Use, or thrown into “The Games”. The Games Consist of Disc Battles, and/or Light Cycle Combat. If you haven’t seen the First Film then let me just say, the Disc Battles, as well as Light Cycle Combat was cool and basically made the first TRON, and in this New Sequel is about 100 times cooler. Just see it. I’ll take this moment to say the Program World is basically a World of Lights, Coupled by a Solid Musical Score Crafted by a Band called “Daft Punk”. When you watch this movie, turn down your Right Brain Senses of Logic Etc., and Heighten your Left Brain Senses of Art and Existential Beauty, and just Enjoy the ride. Back to the Story. So after a Session of Games Sam is brought to the Now Leader of this Digital World. CLU. That’s right, CLU, the Program from the First Film that Flynn had Created to infiltrate Emcom. 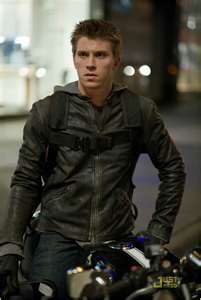 Thusly, he looks just like Flynn, and at first, Sam thinks it is his Father. But he is far from. CLU then does battle with Sam, but Sam is Freed from the Games by a girl named Quorra. Played excellently by Olivia Wilde (Of House Fame). If you know anything about me, you know I like Strong Female Characters, and she does not disappoint. Quorra then leads Sam to his actual Father Flynn. That is as much of the Story as I’m going to say/tell, but if you love Visual Magnificence, and Dig Digital Trance Like Music, than this film is for you. Not to mention Exceptional Performances from Jeff Bridges, Garrett Hudland, Olivia Wilde, Bruce Boxleitner and Michael Sheen. Kevin Flynn/CLU (Jeff Bridges) – As Both Kevin Flynn, and CLU. What can I say about Jeff Bridges, he is an Absolute Brilliant Actor. A Creature of his Craft. He is the Backbone of both the Original TRON, and this New One. Sam Flynn (Garrett Hudland ) – Talk about a Tough Role, not only Playing The Son of Flynn the Lead Character in the first Film, but also having had Jeff Bridges play that Role, who is a Hard Act to Follow. Garrett does an Exceptional Job in a Role that basically could have Made or Broke this Film. Quorra (Olivia Wilde); Like I said above, Quorra did an Excellent Job portraying a Creature of the Program World. Naive, yet Wise and Capable. Lucian. 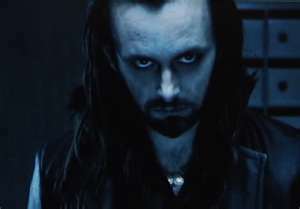 If you haven’t seen “Underworld: Rise of the Lycans”, check it out. He’s reason enough. Though I do believe he’s in the Original “Underworld” as well. Alan Bradley/TRON (Bruce Boxleightner) – Nothing like a Little Humility to an other wise World of Lights and Music. 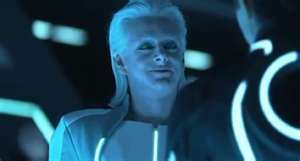 Bruce Brings a Humbleness to both the TRON Films in his Portrayal of Alan. 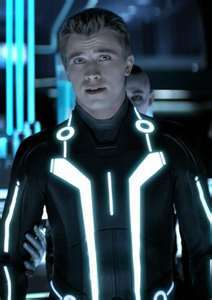 And as TRON in the Original Film, he Shined. Director; Joseph Konsinski had the unruly task of bringing forth a Sequel to a Film that was at it’s time Ahead of it’s Time. Perhaps that’s why the 28 Year Separation of the Two Films Worked. Steven Lisbergers (Creator, Screenplay Writer, and Director of the Original TRON) Dream is Alive and well. Well done Joseph. Overall Rating; A Solid A. 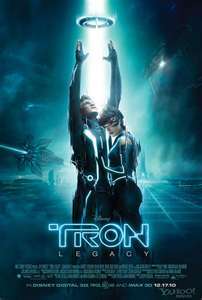 Maybe you think I’m too Generous in My Ratings, but as a TRON Fan this Film hit the Mark. And as a Film Maker, it was a Visual Wonder. Enjoy/Check it out. P.S. The Bigger the Screen you see this on, the Better. But even a 9″ would be fine.